Where do preachers get their ideas for sermons, and how do they turn those ideas into great sermons week after week? Sharing their experiences, these dynamic women preachers take us through their process from conception, through development, to the actual delivery of the sermon and beyond. 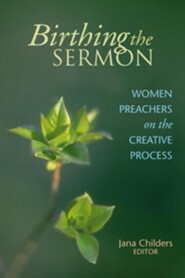 Each chapter includes a sermon that illustrates the results of that preacher's labor of love. Contributors include: Barbara Shires Blaisdell, Teresa L. Fry Brown, Jana Childers, Linda L. Clader, Yvette Flunder, Mary G. Graves, Linda Carolyn Loving, Barbara K. Lundblad, Karen Stokes, Barbara Brown Taylor, Mary Donovan Turner, Margaret Moers Wenig. Jana Childers is dean of the seminary and professor of homiletics and speech-communication at San Francisco Theological Seminary in San Anselmo, California, and is a minister in the Presbyterian Church (USA). I'm the author/artist and I want to review Birthing the sermon: women preachers on creative process - eBook.